When I first made this recipe, I immediately slotted it for the Super Bowl. Obviously most men would be aghast that you served cauliflower for the biggest game of the year. But honestly, who says you have to tell them? Say that it’s rice, they’ll think it’s rice — There’s plenty of cheese to mask the truth. But after obsessively eating them for lunch, and dinner, and one particularly giant snack, I’m completely rethinking my stance. 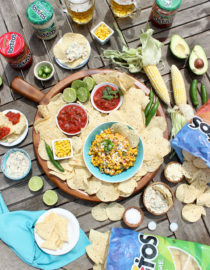 Because while they’re still an incredible appetizer, I actually like them better as meal! 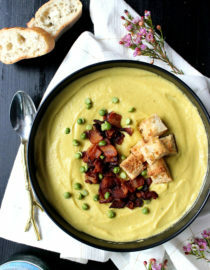 So basically this is two recipes, in one! 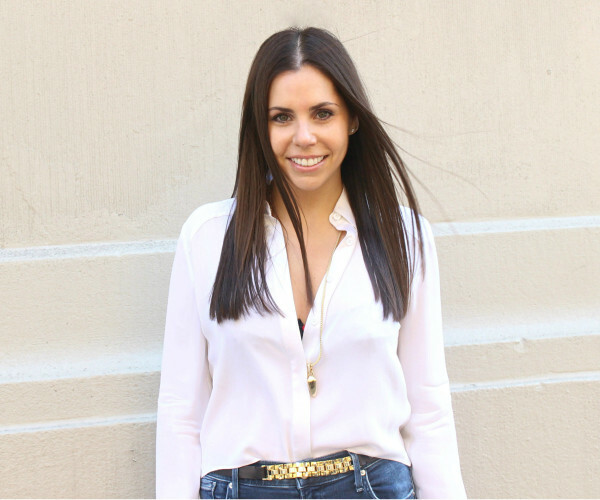 Happy Friyay to you. The cauliflower revolution continues to burn bright, so I figured I’d jump back on the bandwagon and whip up something new. About two years ago I was SUPER into the cauliflower thing, and was often using it to make some sort of dip, crust, or mash. But like any overindulgence one day I woke up and cauliflower was a giant NO — I couldn’t stomach another white flake. So for a while cauli and I went our separate ways. But since Trader Joe’s throws pre-packaged, riced cauliflower in my face on the weekly, I eventually caved. 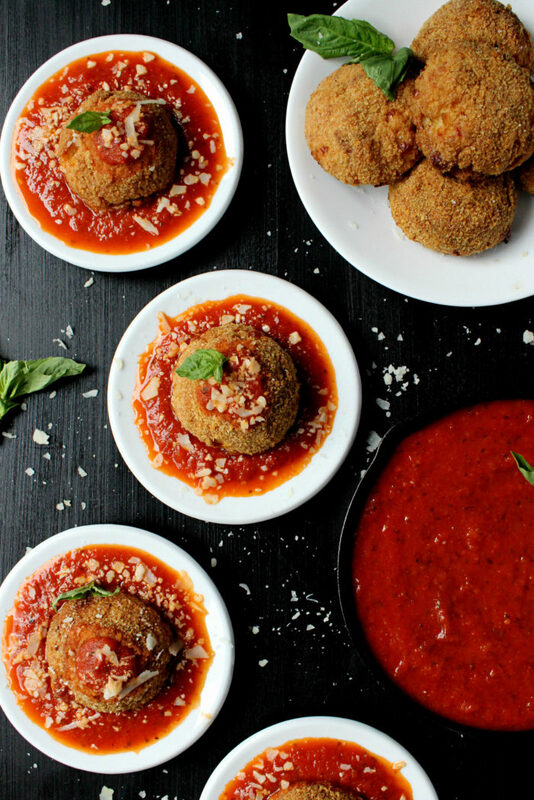 And so I used that bag to make these arancini, and guess what? I am — yet again! — overindulging the hell out of this recipe. Old habits die really, really hard. Traditional rice balls are made with risotto, so naturally this low-cal, low-carb version isn’t nearly as creamy. But the texture of the cauli is similar, as is the crisped, baked crust. 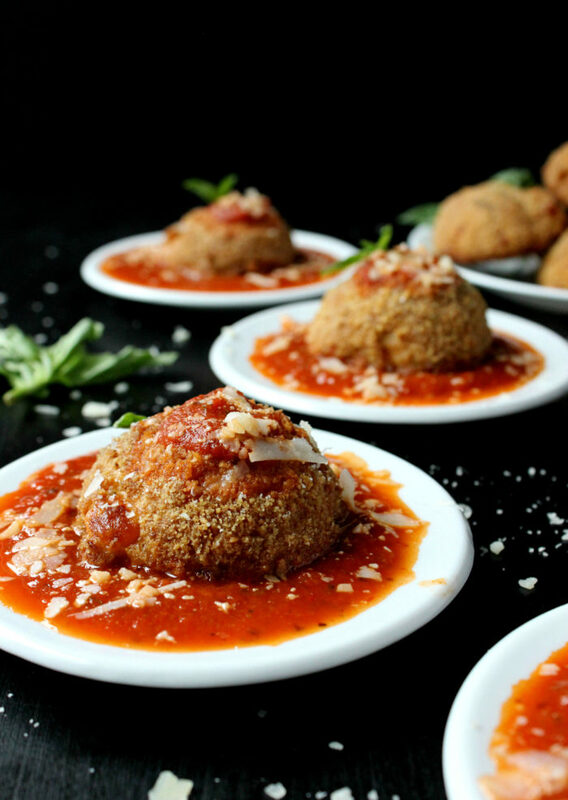 So it’s not a total deviation from classic arancini, just a healthier one. The prep here is pretty classic and easy, so this is a manageable recipe for just about anyone. You start by sautéing riced cauliflower in EVOO, garlic, and seasonings until lightly tender and fragrant. Let it cool completely, then combine with egg yolks, mascarpone cheese, and shredded mozz. This mixture will then chill/solidify in the fridge for 30 minutes, making the cauli easier to handle. And once that’s done, simply roll up your balls, stuff ’em with more mozzarella, and dredge in flour, egg, and breadcrumbs. From there they’ll be baked to crispy, crunchy perfection in 45 minutes. The cauliflower’s mild, yet vaguely nutty taste absolutely comes through here, but not as strong as you’d think. 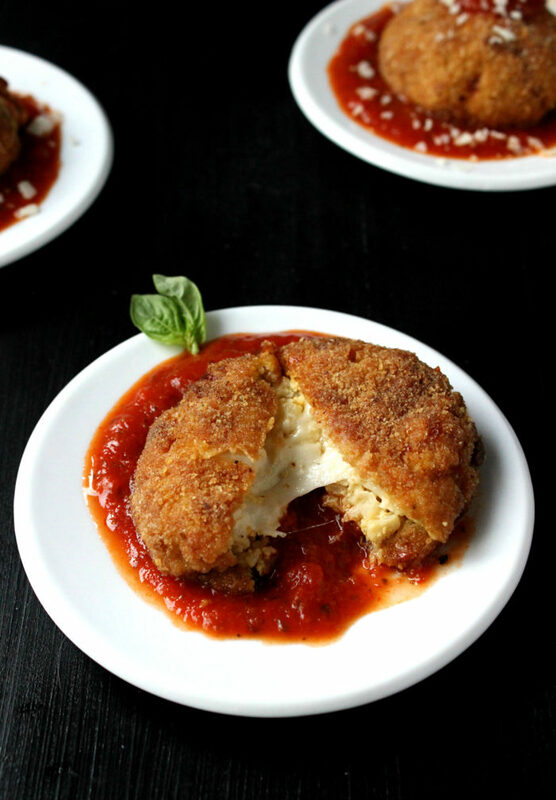 The combination of mozzarella, seasonings, and marinara + sharp cheese really masks the cauli flavor, so don’t be shy about serving this to unsuspecting gentleman. Thanks to a healthy coating of olive oil these bake up wonderfully golden, and the cheesy, gooey insides are just crazy yummy. Plus — is this plating not everything?! 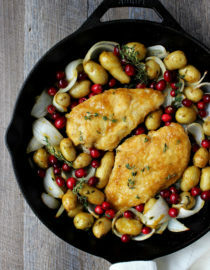 In a medium-sized skillet warm the EVOO and garlic over a medium flame until fragrant, about 1 minute. Next stir in the cauliflower, oregano, basil, and salt & pepper, then saute until cauliflower is just becoming tender, about 5 – 7 minutes. Transfer to a large mixing bowl to cool completely. 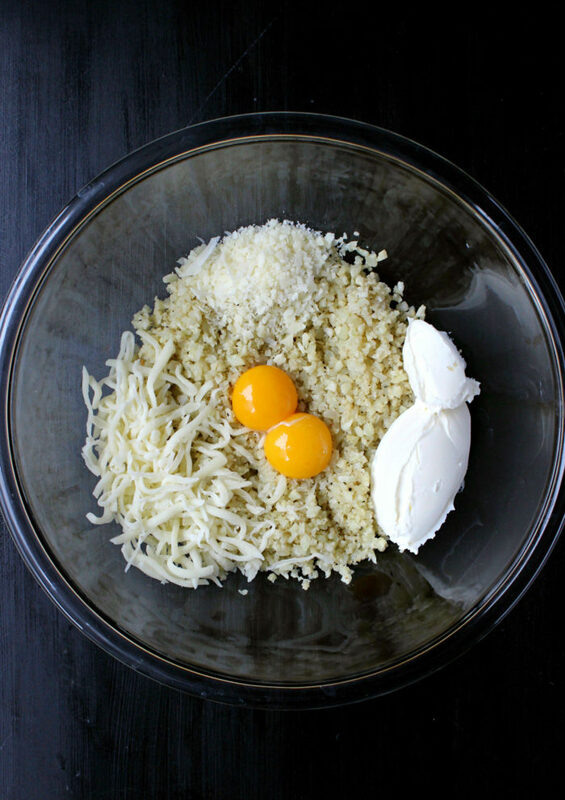 Once cool, combine the cauliflower with the egg yolks, mascarpone cheese, shredded mozzarella cheese, and sharp grated cheese, stirring well. Chill this mixture in the refrigerator for 30 minutes. Pre-heat oven to 375F. Amply grease a baking sheet with olive oil or cooking spray. 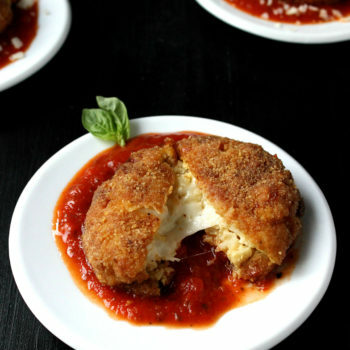 Using wet hands, form the cauliflower mixture into a ball, then squeeze a cube of mozzarella into the center. 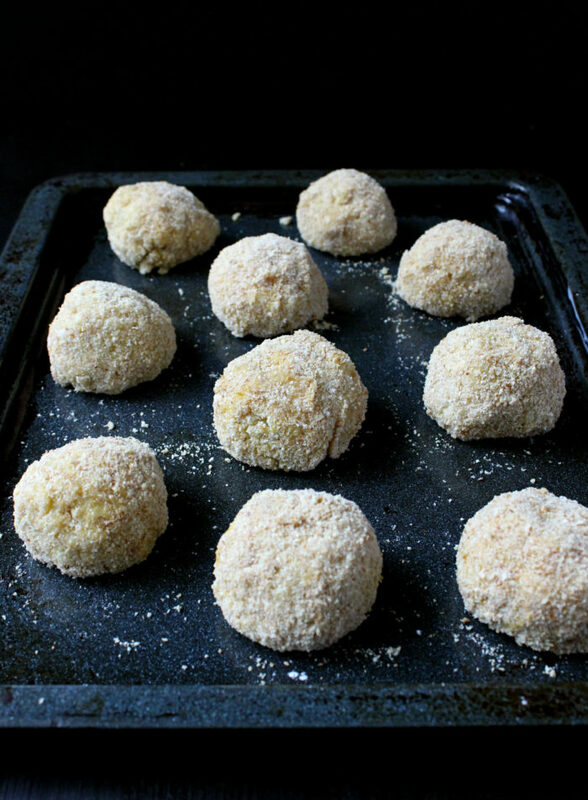 Roll each ball in flour, dredge in the egg, and coat in breadcrumbs, then transfer to greased baking sheet. Repeat until all ingredients have been used. When ready, use a pastry brush to coat the top of each ball with olive oil (you can also spray each ball with cooking spray! ), then bake on oven middle rack for 40 – 45 minutes until browned and crisp. 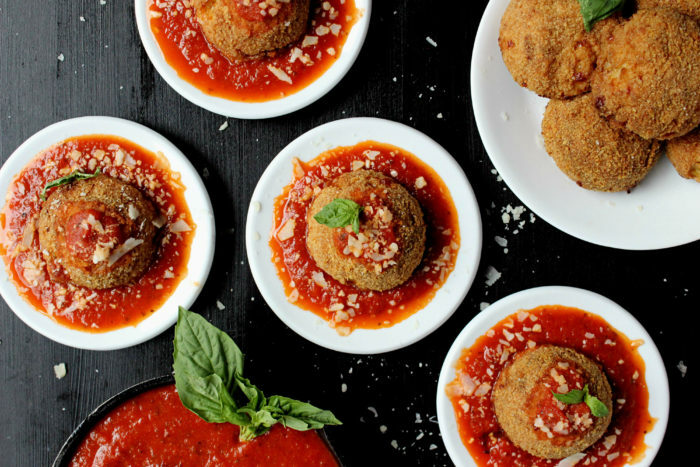 Serve immediately, pairing with marinara sauce for dipping and garnishing with basil is desired. 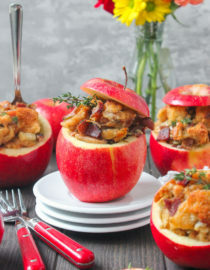 This is such a creative recipe!! 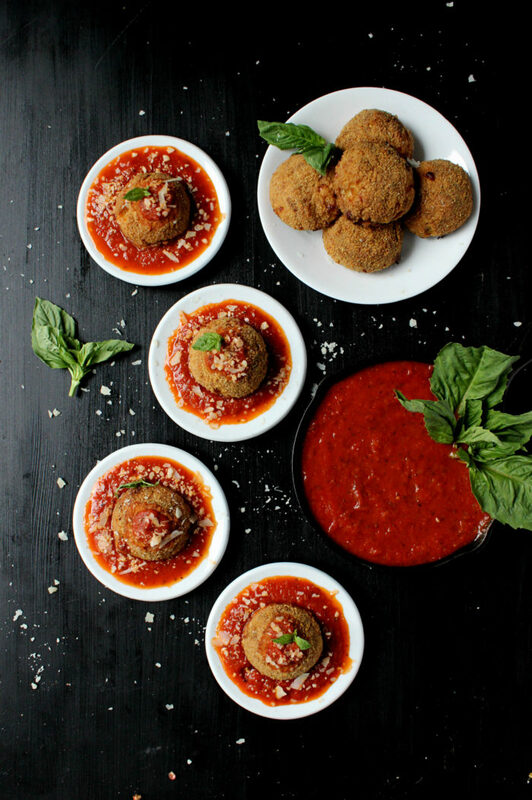 I haven’t tried to make arancini at home before, (probably because I haven’t been up for the challenge of making risotto at home yet), but Trader Joe’s Riced Cauliflower would make this so easy! yes! 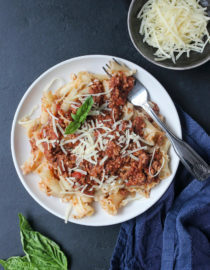 the pre-packaged bags make this recipe SO simple, I love them. I’m just starting to hop on the cauliflower train and these look like they could be my gateway drug! 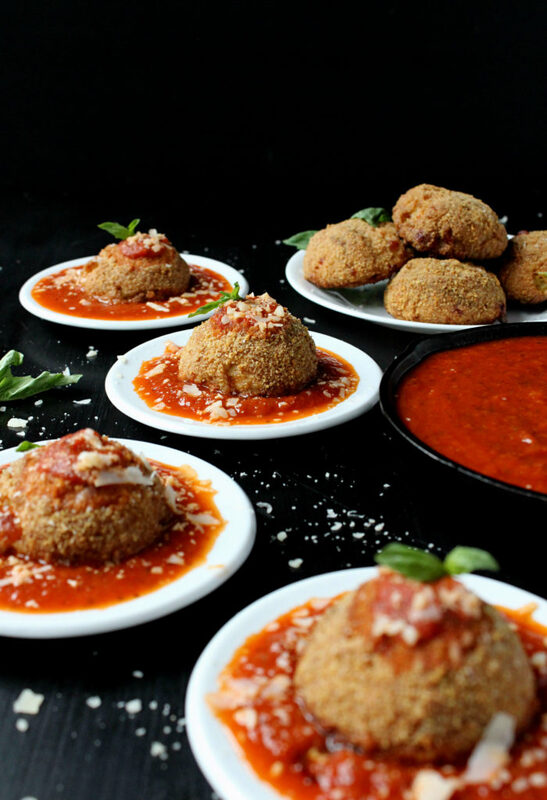 I love arancini, so giant healthier cauliflower arancini couldn’t be any more tempting. Can I make the cauliflower mixture in advance and refrigerate until I’m ready to ball them up and bake and eat them?